Bram Bos, developer of Phasemaker and Ruismaker, has released Troublemaker! This TB-303 clone app sounds quite good despite its frequent protestations that, "this is not a 303." In addition to all of the controls and squelchy goodness you'd hope from a TB-303 clone, Troublemaker packs in a lot of goodies; including fuzz distortion, delay, and LFO modulation of the filter. The typical square and saw oscillator waves are present, and sound excellent, but Troublemaker also includes 8 additional "special waves" like an FM Bass and Rich Saw. 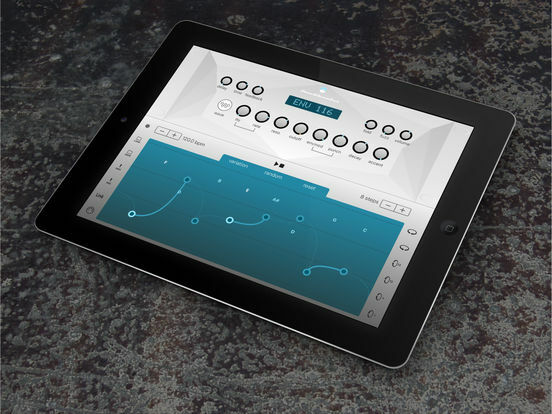 Version 1.0 sports support for everything from Ableton Link to Audiobus! Anyone with a passing interest in having a fun Acid House jam will dig this. Serious Acid fans will appreciate some of the extra tools added in here, like the Punch control that lets you drastically change the behavior of the Filter Envelope. I personally love the fuzz distortion; which is both gritty and biting, but not too messy. If anyone bites, would you let me know if it has a noise component? Or is it strictly oscillator based? It is a single oscillator for your sound source. Of the 10 available oscillator types there is not a noise option. i had a quick play tonight and i like the interface to defining notes , slides , accent. i'm not sure exporting to audiocopy works but its nice that the wav export does the entire filter sweep and not just the amount of steps . would be nice to have more than 16 steps and tweak how the variant options works (keep notes, steps , slides or whatever , at the moment its quite random). i knocked out lots of nice basslines very quickly , it sounded good and squelchy too.and comes with some classic acid lines in the presets. It really sounds good, this thing. Really good. It bubbles and squeals just as in the video. To my grand frustration it doesn't seem to respond to MIDI beat clock / start / stop when used as a standalone app. Argh. I suppose that makes it very TB-303 like! Yes, I can feed it notes on a MIDI channel and it will play them and the controls can be manipulated with CC but then all the goodness of that interface with the slide and accent goes away. Please, Bam Bos, just let this thing just start and stop the current pattern when MIDI start and stop messages come it's way! To my grand frustration it doesn't seem to respond to MIDI beat clock / start / stop when used as a standalone app. Argh. I suppose that makes it very TB-303 like! If you select export MIDI (to your DAW), then drive the AU version with it, all accents, slides and ties etc play intact (I'm not sure how) but I just confirmed this with Bram over at the musicAppBlog as I was curious about the workflow too. I wasn't aware there was a slide/tie controller in MIDI but he may be using something else in the protocol to trigger it (alternatively in the export) etc. Naturally if you just drive it yourself generically then whatever it is won't be there; thus that's the workflow! Thanks for that. I'll see what I can do exporting/importing the MIDI and driving it. I can't say that such a workflow is conducive to the way I like to experiment and keep the winners and ditch the losers. I wish it would just start and stop with MIDI as a standalone app, and that I could select between a rack of patterns with CC or with notes outside the playable range. I may just end up waiting until that becomes a reality or keep using Bassline. Thanks for checking out the workflow possibilities though.